Learning how to cook sausage is not as stupid as you might first think, it's is equally important as grinding, seasoning, mixing and stuffing. Whether you grill, poach, roast, steam or smoke there's a science behind both the succulence and the safety. If you've read my article about making homemade sausage then some of the science follows on nicely. You'll see that cooking temperature is a significant driving force behind the best results but the first point has to be about safety. 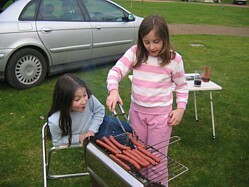 It's child's play once you know how to cook sausage! Sausage is a ground meat so cannot be served rare, it has to be well done. Dependent on what is in the sausage, the final cooking temperature may vary but the general guide is stick to the safe internal meat temperatures for well done meat in my guide. Resting time is just as important with sausage as it is with other cuts of meat. During the resting phase the core temperature can increase by up to 5°C (9°F) which is worth noting when you read about the effects of overcooking sausage. Note however that the effect will be greater in a thicker sausage than in a thinner one. If you are choosing to smoke sausage then your sausage must be cured otherwise you risk exposing yourself to botulism, a potentially fatal form of food poisoning. Smoking sausage is a different technique to cooking so I will not be discussing this technique any further in this article. The remainder of this article is looking at the factors that affect the appearance, texture and juiciness of your sausage when cooked. I'll first look at these factors while considering grilling because it's probably the most popular cooking method for the barbecue enthusiast and then look at how to apply the same controls to other cooking methods. Keep the fat in the sausage and let it drip out naturally. Don’t prick the skins. Depending on the fat type used it will start to render at quite low temperatures and the casing is there to retain as much of this liquefied fat as possible. Make sure that your sausages are fully wrapped in the skin. When you separate them always give the skin a twist to tighten the link before cutting with a sharp knife or scissors. This point only applies if you are making homemade sausage. Sausage seasoning is added to the ground meat in solution (usually water) and when the sausage has been stuffed into the casing it's not uncommon to find some moisture exude from the meat. Store your homemade sausage wrapped in paper towel on a deep sided tray for 12 hours prior to cooking. This will provide time for some moisture to be re-absorbed into the meat and the rest to be soaked up by the towel and not end up all over the bottom of your refrigerator. To learn the techniques we have to understand what's happening inside the sausage in particular the relationship between the meat and fat as the temperature rises when the sausage is cooked. I talked about the myosin emulsion in my article about making homemade sausage and the science behind how to cook sausage so that it is moist and juicy comes right back to this emulsion. One other point to note as you read on is that poultry fat starts to liquefy at 21°C (70°F) whereas pork fat liquefies at 55 - 60°C (130 - 140°F) which makes it ideal for cooking sausage. When the internal temperature of the sausage mix reaches 50°C (120°F) the myosin starts to coagulate and envelopes both the meat and fat particles. When pork fat starts to melt at 55 - 60°C (130 - 140°F) and juices are released, the coagulated myosin particles help to retain these juices. If you've used exclusively poultry fat then the fat melts before the myosin coagulates and this will affect the final results in terms of juiciness. Thus pork fat is a great addition to any sausage unless you've left it out for dietary reasons. At 60°C (140°F) the muscle meat will start to shrink and this will squeeze out some juice but assuming that you have not pricked the skin of your sausage then few of the juices will be lost. As your temperature rises, so more shrinkage will occur and more juice will be lost so it's important not to let the internal temperature of your sausage exceed that which is required for food safety. Finish the cooking at when the temperature in your sausage reaches 72°C (162°F) and let the resting phase take your sausage up to the safe internal temperature. It's also preferable to let sausages rest and cool a little because as the sausage cools the muscle meat will start to relax and absorb some of the juice that has already been squeezed out of the meat but still resides in the casing. To maximise flavour you also want the outside of the sausage to caramelize and turn brown in colour (the Maillard reaction). This makes grilling a great way to cook sausage. Practically speaking what this all means is that the best way to cook sausage is slowly over gentle coals and turn the sausages frequently. By doing it this way the sausage gently browns in colour, you also keep control of the internal temperature and minimise any chance of over-shooting the safe temperature which will lead to a dry sausage. Poaching is a great way to cook sausage in a controlled manner and is a popular way to cook emulsified sausage such as a Frankfurter or Wienie. Technically it's nothing to do with barbecue but that said hot dogs are synonymous with barbecue so forgive my digression onto poaching. 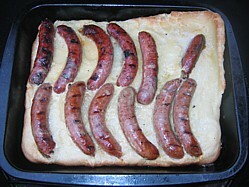 Poaching can also be used as a way of re-heating sausage but if a freshly made sausage is poached then it is usually grilled or fried subsequently to add colour. The benefit of poaching is that you can accurately control the cooking temperature and therefore ensure that you don't overshoot the target safe cooking temperature. The negative is that you are cooking in water and therefore it's inevitable that there will be some leaching of flavour. Note: Poaching is not the same as boiling or simmering. Poaching takes place at a lower temperature. If you have a remote bbq thermometer that reads both oven temperature and food temperature then you'll find it handy for poaching. Just place the food probe in the sausage and the oven probe in the hot water. You need to start with enough water to fully immerse all the sausage that you want to cook, heat the water temperature to 82°C (180°F) and dissolve ½ teaspoon of salt for every litre (quart) of water used. Place your sausages in the water (this will lower the water temperature) and bring the temperature back up and stabilize it between 77°C & 82°C (170°F & 180°F). Stir occasionally to ensure even heat distribution. The temperature where food is safe to eat is the same as with grilling (and so will the temperature continue to rise when resting) so poach until the core temperature of the sausage reaches 72°C (162°F). Why steam? Just like with vegetables, steaming keeps more of the flavour in the sausage than if poaching fully immersed in water. But at the same time steaming is a higher temperature than poaching right? Well actually you can steam at lower temperatures. The process for how to cook sausage inf the steamer is exactly the same as poaching except that the sausage is placed on a steaming rack rather than being immersed in the water. Heat the water up to between 77°C & 82°C (170°F & 180°F) as I described for poaching and steam the sausage until you hit a core temp of 72°C (162°F). As with poaching, make use of your remote BBQ thermometer to monitor the water temperature and the internal temperature of the sausage. Now this section is more back to barbecue because this is the equivalent of cooking indirectly although not necessarily at low temperature. Roasting in an oven is the traditional way to cook a Cumberland sausage ring or toad in the hole. It's easy to cook this way, just place in a roasting tray with a small amount of oil to stop them sticking and slam the tray in the oven. But at the same time you need to be cooking at least at 150°C (300°F) to ensure that the sausage browns and this presents the risk of over-shooting the target 72°C (162°F) mentioned earlier.